Our most festive springerle design! 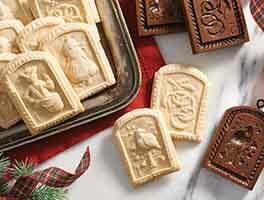 Custom-designed for King Arthur; single 4" x 3½" mold creates 4 iconic Christmas images (each design is 1¾" x 1½"). 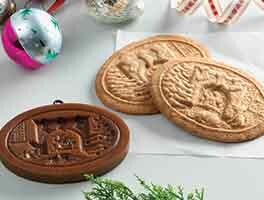 Made in the USA, the sturdy resin and wood composite mold will last for generations. 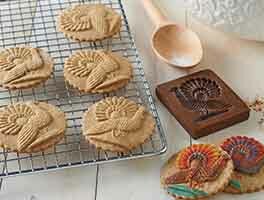 Simply press the mold into your holiday cookie dough (we love using gingerbread, springerle, and speculaas recipes) to emboss your cookies. Mold measures 4" x 3½"